Thousands of acres of barley, alfalfa and grazing pasture blanket south-central Idaho, but the success of all of these crops relies at least in part on another, often-overlooked aspect of agriculture—bees. Increasingly, residents are taking to the art of raising honeybees. Maintaining a healthy local bee population takes hard work and dedication, especially given the challenges of the Wood River Valley climate. "The hardest part is just keeping them alive," said Norma Kofoed, business manager for Buhl-based Vee Bee Honey. The company, owned by son and beekeeper Scott Van Derwalker, keeps a set of hives in Buhl and another in Quigley Canyon, east of Hailey, where she says the climate is a major concern. "Weather like we've had this spring is difficult," she said, adding that bees need good weather to get outside and recover from a long, hive-bound winter. Tom Harned, a beekeeper in Bellevue and an energy auditor, said last year was bad for his bees. "It's like raising any other crop," he said. "It's dependent on the weather—if there's too much sun, too much rain." Harned and Kofoed both blamed last year's cold, wet and late spring for delaying the growth of their hives. When the weather is rainy, bees can't fly—and if bees can't fly, they can't gather nectar and begin the process of reproduction. "When the honey flow began in earnest, the hives weren't large enough to take advantage of all the nectar that was available," Harned said. "I want my brood to be big the day the nectar starts flowing." The hives typically hold 40,000 to 60,000 bees, including a queen that lays upward of 1,000 eggs each season. Harned said he can attempt to compensate for a late nectar-gathering start by feeding them, either with honey from the last season or with a syrup made from equal parts sugar and water. "It's a management technique," he said. "As a honey producer, you want your bees to be able to get up and get out the door and get that honey." Bad weather means less honey but also stressed-out bees. Bees are natural overachievers, Harned said, working away unless the weather prevents them from doing so. "When there's no work for them to do, they get a little cranky," he said. "When they have a job to do, they are very passive." Kofoed said the number of stings her beekeepers suffer each day depends on the weather, which affects the bees' moods. "If it's a nice warm, calm day, they're happy and don't pay much attention to the beekeeper," she said. Cold winds and rain are another story, however. Kofoed said that when a beekeeper enters the yard on a day with bad weather, the bees "come looking for you." Predators are also a major stress factor, Kofoed said. Bears destroy hives for the honey, and skunks eat the bees themselves when given the chance. 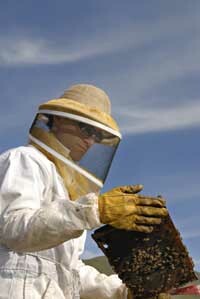 Vee Bee Honey had to move a hive a few years ago when a bear discovered the operation in Grangeville, Idaho. "Once they know there's honey there, you can't keep them away," she said. "You have to move your bees." She said predators not only steal honey and cripple production, but also make the keepers' task harder. "When a predator like that gets into the hive, the bees are really defensive. When the beekeeper comes along, they're the enemy, too." Beekeepers are not a threat to the hives, but human habits certainly are, Kofoed and Harned agree. Harned said the human urge to eradicate every dandelion in search of a pristine green lawn is a major threat to bee populations valleywide and across the nation. "Our society has made it hard on the bees to find food," he said. "The bees need those dandelions to stock up on." Kofoed said the dandelions are the first flower that the bees can find when they leave the hive in spring, and help alleviate the effects of winter. "It acts as a spring tonic for them," she said. "You feed them sugar water or corn syrup continuously, and they don't get the vitamins and minerals they need to stay healthy." The biggest stress producer of all, however, is a shakeup in the bees' social structure. "They are a little society, they are a little culture," Harned said. "Everyone has a job." Most bees in a hive are worker bees, females who fly out, gather nectar, tend eggs and build combs. But the integrity of the hive relies on the queen, a special bee who lays all the eggs and puts out pheromones that dictate the workers' actions. "Everyone understands when they smell her that she's there, everything is fine," Harned said. But everything changes in a hive without a queen. Harned said that when he opens a hive and the workers scatter, he knows a queen is dead and the bees are stressed. Normally, bees can sense a change in an aging queen's pheromones and can take action to produce a new queen. Worker bees add a secretion to the normal food that they give developing eggs, turning the nourishment into royal jelly, which will produce a queen egg. When a new queen is hatched, the workers will surround the aging queen and smother her, performing what is colloquially known as a "cuddle death." If a queen dies unexpectedly, however, Harned said the bees have to swing into action before the eggs get too old to change into queen eggs. "They have only three days to figure out the queen is dead and change that egg's destiny, so to speak," he said. But most of the time, everything turns out for the best and a queen can be found. "It's refreshing for me to see how that society works, and it works so well," Harned said. "They are inspiring little creatures." For the average consumer and valley resident, bees are all about the honey, something sweet to spread on toast and stir into tea. Kofoed, a retired nurse, said local, raw honey provides benefits beyond being a sweetener, however. "We keep [our honey] raw because it has all of the pollen and the enzymes in it," she said. "When you eat processed honey, you're only eating a combination of different sugars." Julie Johnson, owner of NourishMe Foods in Ketchum, said the pollen helps build up the body's tolerance to local allergens—which is why buying honey produced from hives close by is a must. "All you need is a tablespoon a day," she said, adding that her runny eyes and scratchy throat cleared up when she began stirring local honey into her tea. Both Harned and Kofoed say their honey is raw, meaning that it's heated only enough to let it drip out of the comb. Reducing the heating keeps the enzymes intact, Kofoed said—enzymes that retain honey's healing properties. "This is an ancient medication that shamans used to use," Kofoed said. "They'd put honey on a wound or a rash and it helped it to heal." Honey produces a form of hydrogen peroxide that Kofoed said she has used to clear up skin ulcers. "It's just the magic of honey," she said. "You put it on, you cover it up and it gets well." More than honey, almost all other aspects of the human diet rely on bees. Kofoed said an absence of bees means an absence of pollination, resulting in a dearth of all crops, as well as meat and dairy products. "Without beekeeping, our crops would be very, very limited," she said. "It affects not just fruit and vegetables—you have to think about what it takes to feed a cow. "Our diet would become grain-based, and even that would be limited. We need to keep bees as healthy as we can." Looking to take advantage of raw local honey's healing properties? Idaho's Bounty, Atkinsons' Markets, the Wood River Farmers' Markets and the Wood River Sustainability Center in Hailey carry raw, local honey from various providers such as Vee Bee Honey and Prairie Sun Farms. Beekeeper Tom Harned said he hopes to start selling honey under the name Five Bee Hives in September.